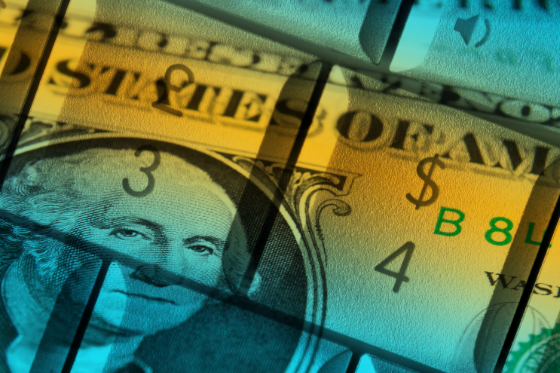 The Federal Reserve finally responded to the market’s beseeching that it pauses its rate increases and not be on a “damn the torpedoes” path of raising interest rates and shrinking the balance sheet. The 10-year Treasury note yield has dropped about 0.50% from its recent peak. The following chart shows how it was around 2.80% to 3.00% for a while until it broke out to 3.20%, only to fall below the trading range. It’s currently 2.68%. We recently refinanced 12 properties and chose variable rate loans for all 12. I am asked quite often when I would choose a fixed rate loan and I always hmmm and haw as I don’t really have a good answer because the flexibility of floating rate debt has been immensely valuable and I believe it will continue to be the case. Equally important, however, are the structural forces that I think will keep interest rates low. Here are a few graphs that I think convey this very well. They are from an interesting article on Seeking Alpha related to investing in bonds and some of the structural forces supporting lower rates. The first one shows the continued deceleration in GDP per capita and it is a powerful factor in my belief that interest rates will remain low. Economic output is a function of the number of bodies doing work, the aggregate number of hours worked, and how productive they are. The number of hours worked is primarily a function of the number of people working and productivity is a function of the effective deployment of technology and how competent, efficient, and trained the workforce is. 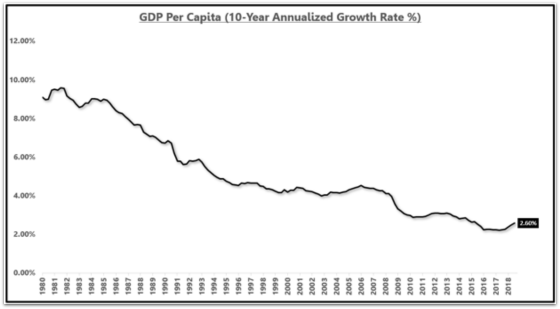 One can see that there has been a fairly steady downward trajectory in GDP per capita since 1981. Thus, it’s not surprising that interest rates were near their peak around that time and have come down significantly since then with the reduction in per capita GDP growth. There is a strong correlation between nominal GDP growth and long-term interest rates. One can see the close correlation between the growth rate in nominal GDP and the 10-year Treasury note yield. And while GDP growth has come up materially from its cyclical bottom, I still think the trend is for it to stay flat or go lower over time due to the growth rate of the labor force slowing as society ages. 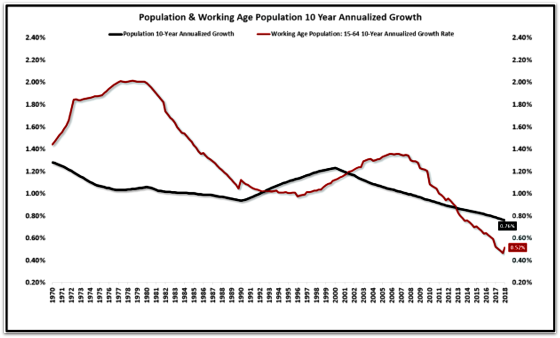 The following chart shows how the growth rate of the working age population has slowed materially and is projected to continue to do so. 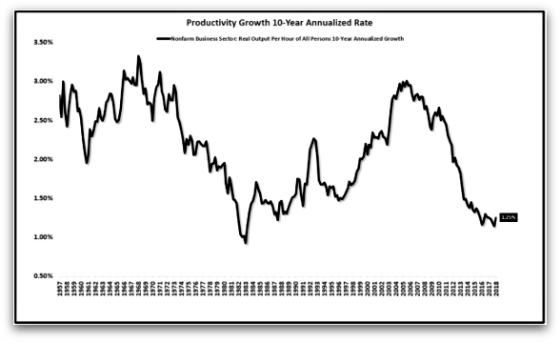 The trend in productivity growth has been quite subdued as well and is projected to continue to be the case as it’s becoming increasingly difficult to generate blockbuster ideas to move the needle. Investing is a challenge because of how volatile it can be and the amount of information we have access to and feel the need to process. These forces prey on our behavioral biases and make use susceptible to making sub-optimal decisions. But if we take a step back and can identify some powerful long-term trends then this can help us separate the signal from the noise and stay the course when it temporarily deviates from how we are positioned and we are losing money. Keeping the bigger picture in mind and insight can help us keep our cool when panic sets in. Of course, this is much easier said than done as I know full well. For example, I was admittedly getting nervous when the 10-year Treasury hit 3.20% as it broke through support levels that had me thinking rates could continue to go higher. With that being said, however, I knew that this is the nature of markets and they will always test investor conviction. I was able to keep calm and stay the course (continue with floating rate loans) after reminding myself that after nine years of economic growth interest rates are still incredibly low and the bond market is telling us something about the future growth prospects of the United States. And what it’s telling us that In the long run, these structural trends are what’s ultimately going to drive future economic growth, which will be muted.